The highly anticipated iPhone X is finally available for pre-order today and it will be released officially in Malaysia on 24 November 2017. As usual, we have the big 4 telcos offering the latest iPhone on contract. Since the iPhone X would cost you at least RM5,149 for the base model, it is probably better to get it on a contract to enjoy substantial subsidies. 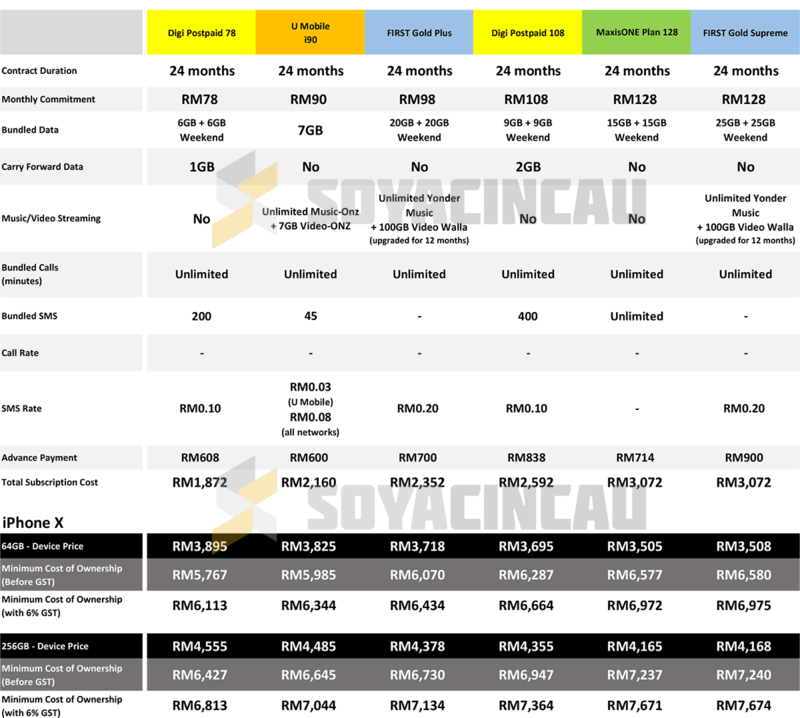 Question is, which Malaysian telco has the best plan for you? We hope to answer that with our telco comparison. 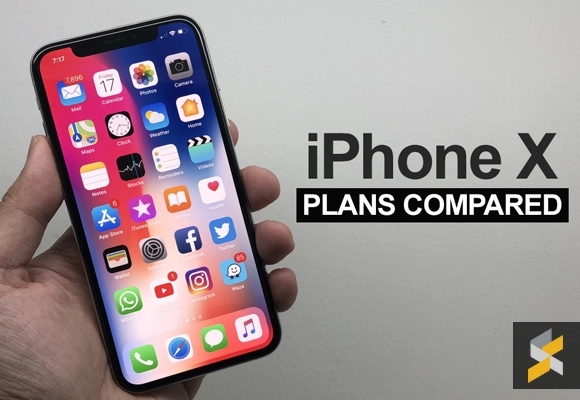 The iPhone X plans from Celcom, Digi, Maxis and U Mobile are identical to the iPhone 8 with a total of 12 plans tied with a 24-month contract. As always, we recommend that you take up a plan that suits your needs. If you look at all the offers, the iPhone X is always cheaper on a higher commitment plan and you shouldn’t decide based on the device price alone. 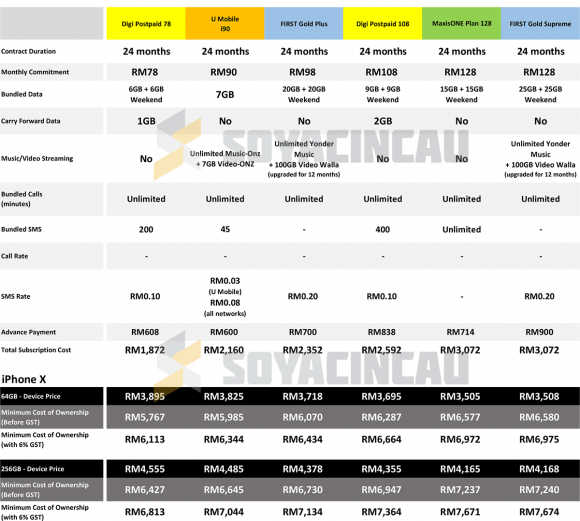 Similar to the iPhone 8 comparison, Digi has the lowest cost of ownership with its Digi Postpaid 78 plan. That comes to no surprise considering it has the cheapest plan for the iPhone X at RM78/month. There’s unlimited calls and 6GB (Allday) + 6GB (Weekend) data which should cover most average users. If you’re looking for the most data for your buck, Celcom stands out from the rest for having the most quota. Their FIRST Gold Plus at RM98/month comes with a 20GB (Allday) + 20GB (Weekend) data and on top of that, it even comes with 100GB of Video Walla for 12 months. 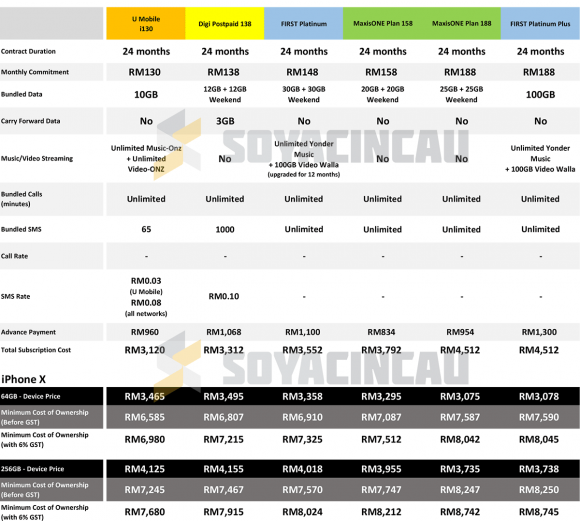 Even on their higher plans, Celcom offers far more data than other telcos in the same price bracket. While none of these telcos offers unlimited data, the closest thing to unlimited is U Mobile’s Postpaid i130 at RM130/month. While it only has 10GB of high-speed data, the plan comes with unlimited data usage for video(Video-Onz)/music (Music-Onz) streaming as well as social apps (App-Onz) such as Facebook, Twitter and Instagram. Looking at Maxis, they are still the most premium of the lot and their most affordable plan costs RM128/month with 15GB (Allday) + 15GB (weekend) of data. 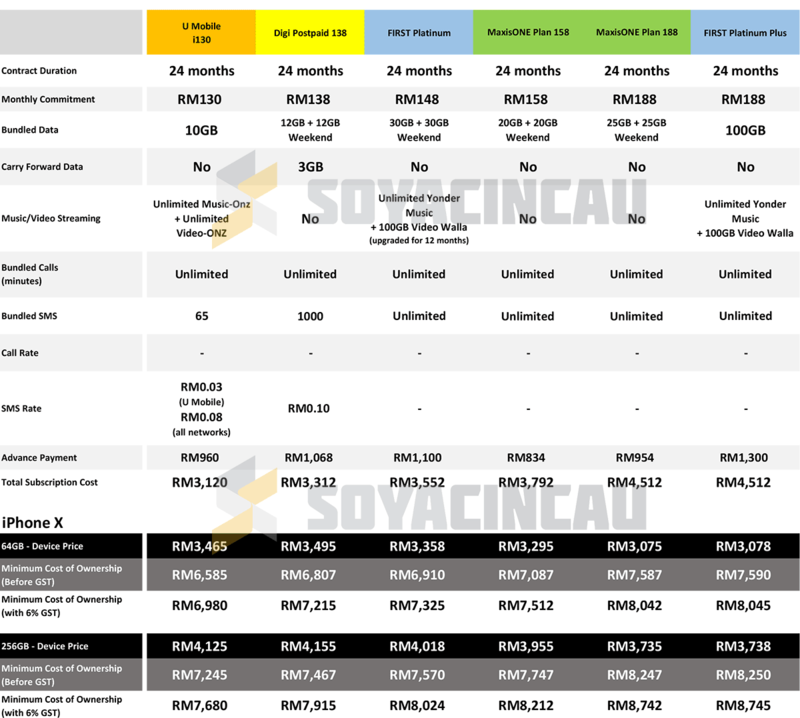 Apart from having a postpaid plan with the most data for your money, there are other factors to consider before you commit to a 24-month contract. One of it is network quality and as you know, not all telcos have the same setup. Your plan can give you loads of data but it can get very frustrating if you can’t get good 4G service in your area. If you’re already happy with your current provider, it is probably best to stick with them when you sign up for a new device. For those who are willing to port out, the best way is to try it yourself by getting a prepaid SIM. Alternatively, you can refer to 3rd party tools such as OpenSignal and YouTube Video Checkup. These will give you a rough idea of each respective telco’s performance. Other factors to consider can include customer service and optional add-ons that you may need such as supplementary line and international roaming. So which plan would you go for? Let us know in the comments below.